FIGURE 1-12 Schematic diagram of a peripheral feedback system analogous to that utilized by PTH and l,25(OH)2D3 to maintain a normal serum Ca2+ level in the range 9.5-10.5 mg/100 ml of serum. FIGURE 1-13 Schematic diagram of a hormone system involving a peripheral feedback mechanism. Many hormonal systems involve the hypothalamus. 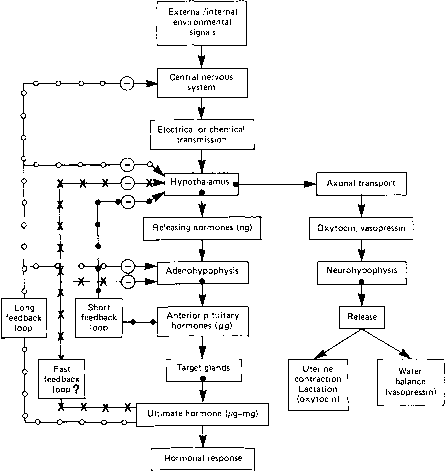 This figure shows a cascade of hormonal signals starting with an external or internal environmental signal. This is transmitted first to the central nervous system and may involve components of the limbic system, such as the hippocampus and amygdala. These structures innervate the hypothalamus in a specific region, which responds with the secretion of a specific hormone, usually in nanogram amounts. Releasing hormones are transported down a closed portal system connecting the hypothalamus and the anterior pituitary. Peptide releasing hormones pass the blood-brain barrier at either end through fenestrations. A specific releasing hormone binds to a specific anterior pituitary cell membrane receptor and causes the secretion of specific anterior pituitary hormones, usually in microgram amounts. These access general circulation through fenestrated local capillaries and bind to specific target gland receptors. The interactions trigger the release of the ultimate hormone in microgram to milligram daily amounts, which cause the hormonal response by binding to receptors in several distal target tissues. In effect, this overall system is an amplifying cascade. Releasing hormones are secreted in nanogram amounts, and they have short half-lives on the order of a few minutes. Anterior pituitary hormones are often produced in microgram amounts and have longer half-lives than releasing hormones. Ultimate hormones can be produced in milligram amounts daily, with much longer half-lives. Thus, the system taken as a whole constitutes an enormous cascade mechanism. With respect to differences in the mass of hormone produced, from hypothalamus to target gland, the range is nanogram to milligram or as much as a millionfold. When the ultimate hormone has receptors in nearly every cell type, it is possible to affect the body chemistry of virtually every cell by a single initiating environmental signal. Consequently, the organism is in intimate association with the external environment, a fact that we tend to underemphasize. Arrows with a black dot at their origin indicate a secretory process. 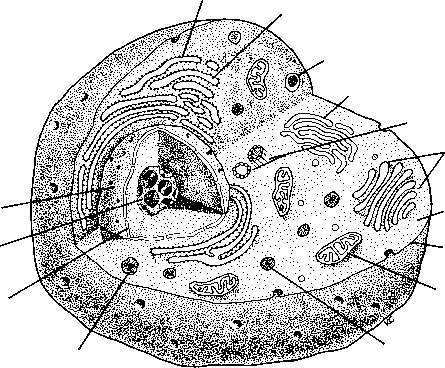 FIGURE 1-14 Schematic illustration of a representative animal cell. The important structural aspects of the cell are identified. the RER. A signal recognition particle (SRP) protein attaches to the signal peptide (the N-terminus region of the nascent peptide) and simultaneously attaches to a SRP receptor in the membrane of the rough endoplasmic reticulum. This facilitates the insertion process of the growing peptide and the efficient accumulation of the pre-(pro)hormone inside the RER. Next, specific peptidases cleave off the pre form (23 amino acids) of pre-pro-PTH. The resulting pro-PTH (92 amino acids) is then cleaved by another specific peptidase so that the mature 1-84 amino acid PTH is packaged into a secretory granule, where it is stored in the chief cell of the parathyroid gland. The PTH is then released from the cell by the process of exocytosis, which results in the contents of the secretory gland being released into the general circulatory system.